The Third Beit HaMikdash / Holy Temple is to come down from Heaven. The Jews yearn for the rebuilding of the Temple in Jerusalem since the destruction of the Second temple in the year 70 Common Era (C.E.). The picture above is a Model of the Beit HaMikdash in Lego designed on Lego Digital Designer (LDD). 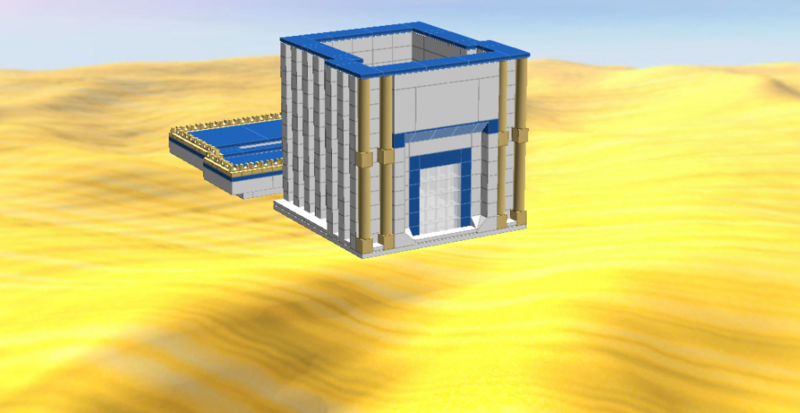 LDD is a free program downloaded at the Lego site that allows you to design Lego models on a computer and saves files in the LXF format. If you want the lxf file of the model above please contact us at info@jerusalemlife.com. It doubles as a Tzedaka Box. One – there will be no more war. Yes. One day – there will be no more war. This is when the Messiah will come. Some say that he will fight a war to end all wars called the war of Gog uMagog. Some say that this person will be so intelligent that he will teach the nations to make peace together. Two – is that G-d / Hash-m – who created the world and took the Jews out of Egypt – will be recognized by all people as the true G-d of the world. Observant Jews recognize the constant good that G-d does for us daily and yearn for other people to love, fear and worship Him. Here are ways to help rebuild the Holy Temple. 1. Stop speaking badly of others. Speaking badly is called Lashon HaRa (Evil Speech). Even if a fact is 100% true – if it is derogatory – we should not repeat what we heard about a fellow Jew. Some take upon themselves one hour to not speak badly of others a day and build up from there. The Chofetz Chaim wrote various books on the laws of guarding one’s tongue. Many are Available in English from artscroll.com, feldheim.com and the Chofetz Chaim Heritage Foundation. Make a 5-minute daily Lashon HaRa learning session with friends or family. 2. Do Acts of Kindness – the 2nd temple was destroyed because of Sinat hinam (Gratuitous Hatred). To remedy this we do acts of Gratuitous love. Acts of Hesed / Kindness. Some make it a habit to do at least one act of kindness to someone else – daily. 3. Jews Observe the Shabbat & Non Jews Observe the 7 Noahide laws. If all the Jews observe 2 Shabbats in its entirety – the Jewish people will be redeemed. Jews and Gentiles may be saved through attaching themselves to Torah. If there is a war Gentiles and Jews can be safeguarded by observing the 7 Noahide laws and the 613 commandments respectively as stipulated in the Torah. 4. Make Peace between others – Have a grudge against an old friend or family member? – forgive and forget. Send a messenger – if you don’t feel up to it – to apologize and make amends. Send a text written by yourself, a friend or a spouse. Make sure it doesn’t refuel the fire but extinguish the fire between you. One of the laws of the Torah is to love your fellow like yourself. 5. Yearn for the Rebuilding of the Jewish Temple / Beit Hamikdash and pray. Learning Torah brings great goodness into the world. Jews learn the Torah. Gentiles learn their 7 Noahide laws from the Torah. A Gentile that learns their Noahide laws from the Torah are considered as great as a High Priest that served in the Jewish Temple. The great rabbis say that we are in the messianic age. Our actions will determine whether it will come sooner or later. To Leave A Message or Tell us of Your Experience with Our Berakha Cards or Materials please Visit Contact Us Section or email us. PLEASE, My Friend, Give to Support Jewish Education & Continuity. True Free Think. Why the World Needs More Tea. Ten Commandments or Seven – Which do You Follow?